This is the basic data hierarchy in OrientDB. 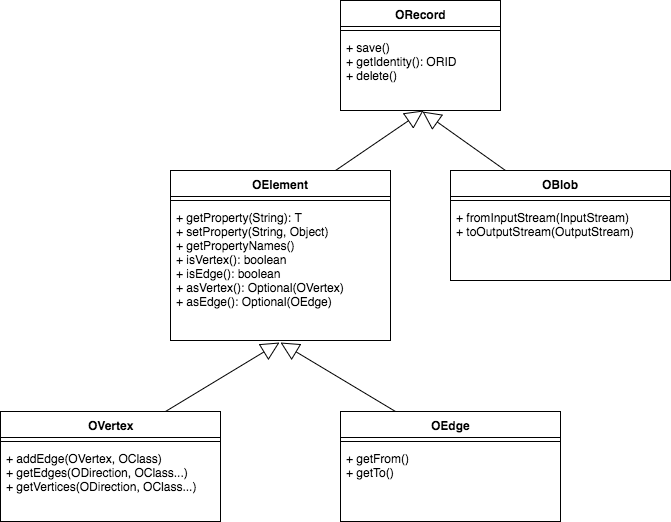 Each document, vertex, edge or BLOB in the database will be represented in Java as an object in this hierarchy. OElement: represents plain documents (so also vertices and edges). It includes methods to manipulate properties and to check if current element is a vertex or an edge. newInstance(String): creates a basic OElement of a given class. newInstance(): creates a basic OElement, with no schema associated (no Class). This method should be used only to create embedded documents, not to create stand-alone documents. To make the element persistent, you have to invoke the save() method on it. If you are NOT in a transaction, the document will be made persistent IMMEDIATELY when you call the save() method. If you are in a transaction, you have to invoke save() and then commit() to make the document persistent. System.out.println(element.getIdentity()); //this will print the valid, final RID for that document. When doing save/commit operations, OrientDB manages a tree of connected documents as a single persistent entity. Sometimes you can have a reference to a document that, in the meantime, was modified by another user/process. OElement interface provides methods to set and retrieve property values and names. A string name can also contain numbers, blank spaces, punctation and special characters. IMPORTANT: Lecagy ODocument API and differences with current API. ODocument embedded = new ODocument(); embedded.field("bar", "value2"); doc.field("foo", embedded); System.out.println(doc.field("foo.bar")); // prints "value1"
System.out.println(doc.getProperty("foo.bar")); // still prints "value1"
Setting a property value multiple times, just overwrites the property value. OElement also provides a method to explicitly control the type of the property value: setProperty(String, Object, OType). This is particularly useful when you do not have a schema but you want to perform specific checks or you want to save embedded documents. You can retrieve document property values using getProperty(String) method. eg. If you don&apos;t know which properties are defined for a specific document, you can use getPropertyNames() to retrieve all their names. getPropertyNames() returns only the properties that are defined (ie. that have a value) for a specific document. It does not rely on the schema, so if you have a property defined in the schema for that particular document, but that document does not have a value for that specific property, it won&apos;t be returned by getPropertyNames(). Vertices and Edges in OrientDB are just plain documents, with the addition of particular capabilities to enforce a graph structure. An OVertex represents a node in the graph, while an OEdge represents a connection between exactly two vertices. ODatabaseSession provides a specific API to create vertices, that is newVertex(String). The String parameter represents a class name (the type of the vertex). There is also a short version, newVertex(), that is an alias for newVertex("V"). IMPORTANT: the class passed as parameter to newVertex() has to be V or a subclass of V.
Creating an edge means connecting two vertices together, so the entry point API to create an edge is OVertex.addEdge(). IMPORTANT: the class passed as parameter to addEdge() has to be E or a subclass of E.
Vertices and edges are just plain documents; each vertex links to its edges and each edge links to the two connected vertices. This said the normal document save lifecycle applies, ie. when you have a graph of vertices and edges connected together, if you invoke save() method on one of the elements, all the connected graph is saved. A graph is considered consistent all the edges are connected to exactly two vertices (from/to). This means that you cannot have edges that have one or both ends disconnected from valid vertices. OrientDB will manage graph consistency for you, that means that if you delete a vertex, all the connected edges will be deleted as well; if you delete an edge, all the connected vertices will be updated to remove the references to that edge. To delete a graph element, you can just use the OElement.delete() method. OVertex and OEdge classes provide methods to traverse the graph, that is, to access adjacent vertices and edges. Given an OVertex, you can retrieve all the connected edges using getEdges(ODirection), getEdges(ODirection, String...) methods. The ODirection can be ODirection.OUT (outgoing edges), ODirection.IN (incoming edges), ODirection.BOTH (all the edges, regardless the direction). The String parameter allows to filter on edge class names; you can specify multiple edge class names, you will traverse all the edges that belong to at least one of the classes you specified. Given an OVertex, you can retrieve all the connected vertices using getVertices(ODirection), getVertices(ODirection, String...) methods. The ODirection can be ODirection.OUT (traverse outgoing edges), ODirection.IN (traverse incoming edges), ODirection.BOTH (traverse all the edges, regardless the direction). The String parameter allows to filter on edge class names; you can specify multiple edge class names, you will traverse all the edges that belong to at least one of the classes you specified. OElement interface provides methods to check whether current document is also a vertex (isVertex())or an edge (isEdge()). It also provides methods to obtain an OVertex (asVertex()) or OEdge (asEdge()) instance from an OElement. These methods return a Java Optional<?> that is empty if the element is not a vertex or an edge.